Michael John Myers (born May 25, 1963) is a Canadian actor, comedian, screenwriter, and film producer. He is known for his run as a performer on Saturday Night Live from 1989 to 1995, and for playing the title roles in the Wayne's World, Austin Powers, and Shrek films. He made his directorial debut with the documentary Supermensch: The Legend of Shep Gordon (2013). He has stepped away from acting for the most part since the third Shrek movie. He had a small role in Quentin Tarantino's Inglourious Basterds (2009) and a supporting role in Bohemian Rhapsody (2018). 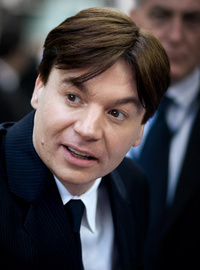 • Mike Myers on Verne Troyer's death: "I hope he is in a better place"
This webpage uses material from the Wikipedia article "Mike_Myers" and is licensed under the GNU Free Documentation License. Reality TV World is not responsible for any errors or omissions the Wikipedia article may contain.